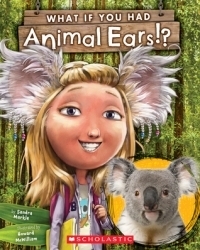 Books Kids Nonfiction What If You Had Animal Ears? What if you woke up one morning and your ears weren't yours? What If You Had Animal Ears explores what would happen if you looked in the mirror and saw an animal's ears instead of your own! The next imaginative book in the What If You Had series, explores incredible ears from the animal kingdom. From the elephant's tremendous ears to the jack rabbit's mood ears, discover what it would be like if you had these special ears--and find out why your ears are just the right ones for you! A book about ears? Yes. A book that teaches you about different kind of animal ears? Yes. A book that lets you appreciate your “human” ears? YES! As adorable as it is educational, “What if You Had Animal Ears! ?” was an instant hit with the kids! They loved learning about the different kind of ears the animals had and how each one had its own perk. Chock full of facts and vibrant illustrations, this is a book sure to delight children interested in learning about their special ears!